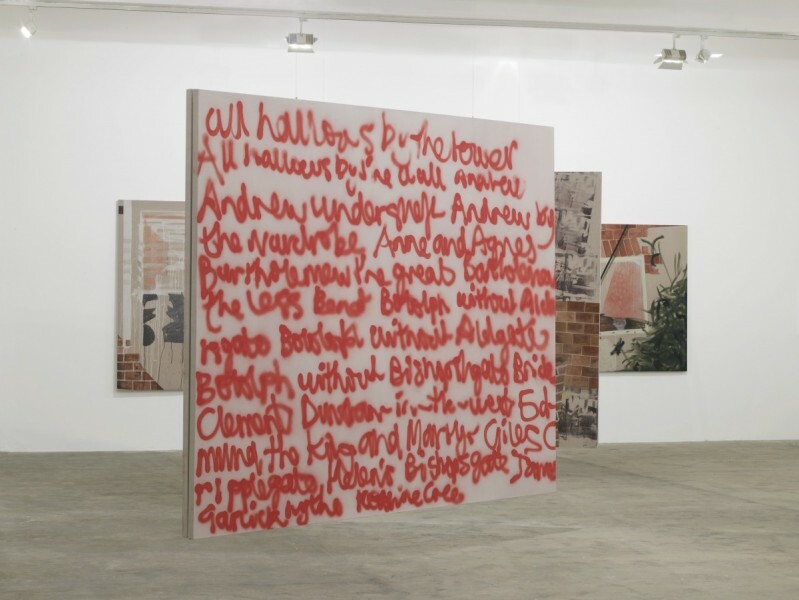 Caragh Thuring, exhibition view, Chisenhale Gallery, 2014. All works 2014. Commissioned by Chisenhale Gallery. Courtesy the artist and Thomas Dane Gallery. Photo: Andy Keate. It is always quite exciting when the Chisenhale Gallery turns itself over to a painter. 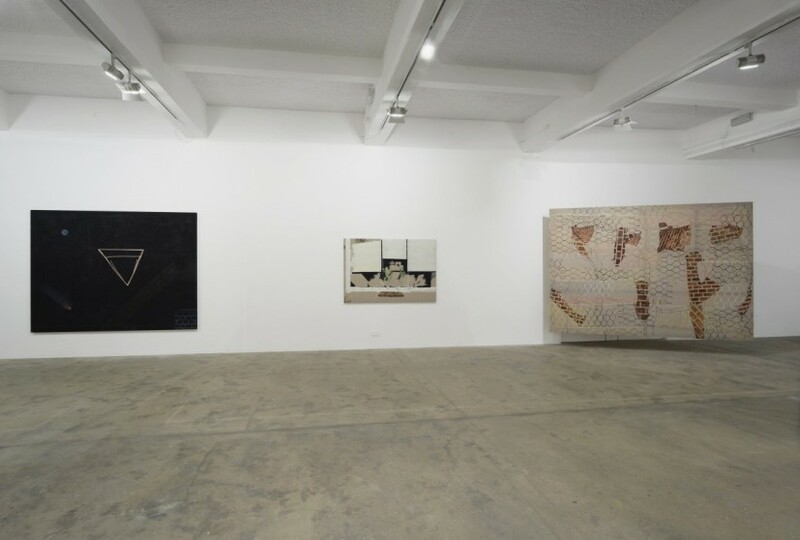 We are more used to walking down the concrete ramp and entering a darkened space to view time-based works, or negotiating installations that cram a maximum of work into the available square meterage. Painters generally return you to the foursquare, rectangular bunker and operate with a sense of spareness by comparison; noteworthy shows by Lynette Yiadom-Boakye, Daniel Sinsel, Varda Caivano and Clare Woods spring to my mind. (The programme at this East London venue continues to be essential viewing for collectors and cognoscenti alike). 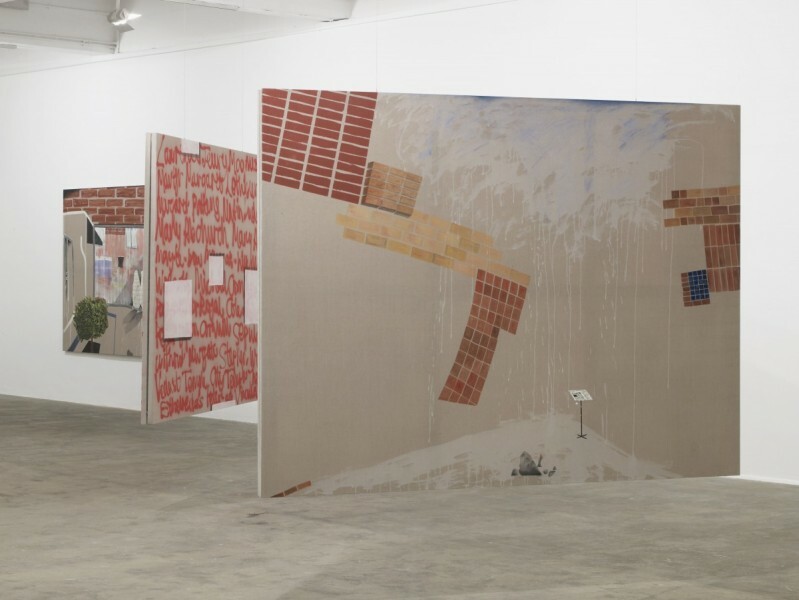 London-based artist Caragh Thuring is the latest painter to take on the Chisenhale bunker and as soon as you push open the doors to the exhibition space you are confronted by canvas. Thuring has installed her largest work as if it were a light-trap for a video installation. The movement of the door creates an inflow of air that causes the canvas to move, and forces the visitor to walk around it. Thuring has un-squared the gallery by suspending paintings back to back in the space as well as hanging more conventionally on the walls. It’s not that this has never been attempted before – I think of Gary Hume’s exhibition at the Whitechapel Art Gallery back in the late 90s for example – but it is a while since I have seen the strategy. Thuring’s treatment of the device is more architectural, but has the same lightly-worn wit and lack of affectation as the paintings themselves. Thuring paints on un-primed linen and this neutral ground features in most of her works, in which motifs hover in delicate counterpoint to each other. 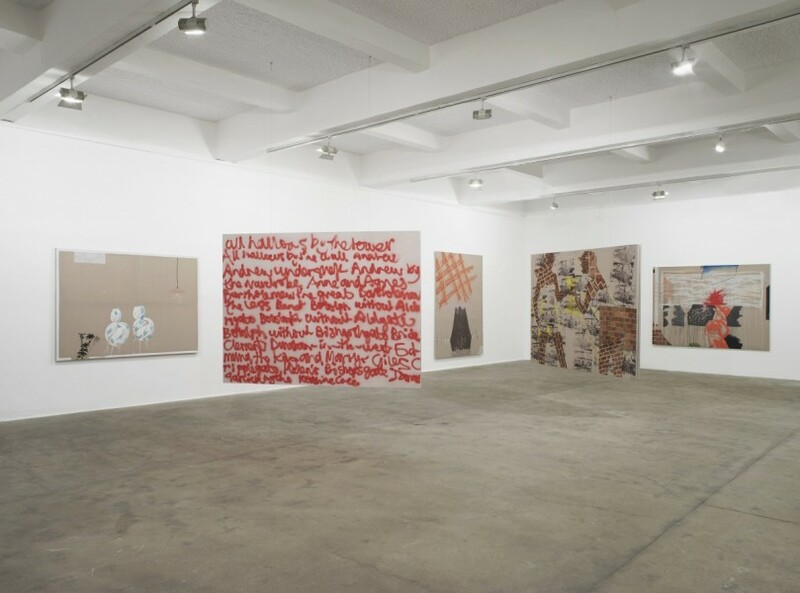 Although she has spoken about not wanting to cover up her support by using primed canvas, the exposed ground is not part of an engagement with the materiality of painting. In interviews, rather refreshingly, when confronted by the tired old question of the “death of painting”, Thuring talks about the absolute freedom of painting in contrast to any other medium. If you paint, you are free of constraints and at total liberty to create… anything. What Thuring paints has a diaristic quality – she is an urban creature, an abiding interest in volcanos notwithstanding. Brickwork abounds. This is very London, also very New York. It recalls early David Hockney for me, in ways I am not quite ready to nail down completely. Perhaps it is an approach to composition that owes something to collage technique. The paintings demand some energetic engagement from the viewer. Stretches of bare linen between motifs require interpretive action, figurative elements are loosely drawn in thin, single colours – lucid ideas held in suspension together. Glimpsed vignettes of city life, other people’s lives, sketched in spare lines. Some of these new paintings are of the windows of private homes in Amsterdam. The artist became fascinated with the curtain-less windows of Dutch homes that not only hid nothing, but displayed on their windowsills little still lifes of vases, flowers and bibelots that expressed the personality of the owners. There is an awkwardness to the compositions that speaks of a deep, fundamental humanity. A back to back pair of canvases that stand apart from more familiar work feature red text naming all of the churches in the city of London. Graphically, it could be angry graffiti, but in fact the words form a somehow soothing and evocative mantra: Anne and Agnes, Bartholomew the Great, Bartholomew the Less, Botolph without Aldgate. Are we strolling the Square Mile with the painter or running our fingers down a directory? It doesn’t really matter, in the sense that we are sensitised, one way or the other, to a granular experience of the world around us. You can’t ask more than that.